Last year I wrote a post for you about just what exactly “geographic education” can look like. Since that time, I have travelled more than 24,000km to Antarctica and home again, and have shared with you some∙of∙the∙ways I’ve used the experience to teach my students about the world and about Antarctica. The purpose of the Grosvenor Teacher Fellowship is to help teachers learn about the world through hands-on, field-based professional development, so that they can share that learning with their students, and my expedition to Antarctica certainly helped make that possible for me and my Grade 1 class. But, geographic learning is not just about faraway places! 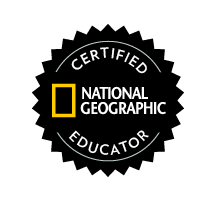 Since returning from my expedition, I was asked to become a beta tester for the online National Geographic Educator Certification Program and learn about their Learning Framework. This framework highlights the importance of the Attitudes, Skills, and Knowledge needed to learn about the natural and human worlds at the local, regional, and global levels through a variety of perspectives. As part of the certification process, I’ve been reflecting on a local community action project that my class undertook this year that I’m especially proud of. It was, in many ways, a teacher’s dream, as it addressed a large number of my curriculum expectations, as well as the Learning Framework and my amazing school’s core values (aren’t I just a genius?). You can see a short video that summarizes the project below. I think what I loved most about the project (besides the amazing empowering impact it had on my students) was that it was hyper-localized to my classroom’s context. My students had been studying topics of (dis)ability since September, when we began our year by reading many stories about the topic, listening to guest speakers share their everyday experiences, and setting individualized learning goals. On our neighbourhood walks, the students noticed for themselves how many more barriers there were compared to accessibility features, and it was on their initiative after seeing one of these ramps that we visited the StopGap website and contacted Luke. And, it was along a busy stretch in our urban neighbourhood, where students had previously noted a dearth of accessible storefronts, that they chose to return to in order to talk with business owners. Indeed, “proud” doesn’t even really begin to describe how I feel about this — I sometimes get teary-eyed just thinking about it. If we’re not teaching our children about the world through learning such as this, just what exactly are we teaching them? If you’d like more information about the whole process behind this project, please feel free to contact me!